Buying a property is a big and critical event in everyone’s life. Be it as an additional investment or for one’s own residential purposes, buying row houses is a wise decision. Generally, people prefer to take apartments or villas; however, both has its own pros and cons. Row houses are for people who want the best of both apartments as well as villas. Row houses are an attractive option for many new homeowners as it provides something of a “middle ground” between villas and apartments. A row house gives you what it feels like to be in a semi-independent villa. Just like how any other fashion trends keep changing, home exterior design trends also keep changing, with time. Especially, with new quality real-estate projects, exponentially increasing in the city, your house might go out of fashion as with any other field, even in housing, change is inevitable. However, this is not the case with row houses as all the houses in your community will be built similarly, so you will never feel left out even down the lane. While row houses can be a bit expensive than apartments, they are definitely way cheaper than villas. For the money you invest, you get good return-on-investment; according to research, appreciation rate of row houses is higher than that of apartments. Also, you save a lot on the exterior and interior design as most of these houses come with an inbuilt design plan. Thereby, you will be getting an economic range of homes that is as classy as an apartment and as spacious as a villa. Since your house will be surrounded by a row or two rows full of houses, row houses are a great way to improve your community living. One of the biggest advantages of these homes is that your neighbors will be from the same societal standard as yours. Their lifestyle, habits, and hobbies will mostly match yours. Also, as parents, row houses are the best growing up environment that you can offer to your children; with many children around, your kids can play and hangout just nearby your homes. Contrary to the popular belief, despite its community living features, your home will have complete privacy as it is as independent as a villa. Unlike apartments or flats, where you cannot ignore your neighbors, in row houses, you can be as attached or as detached as you want with your neighbors. Moreover, you would not be sharing your waterline, garden, or terrace with your neighbors or anyone. If you are a person who lives in an apartment currently, you will know the monotony of living in a single flat. With row houses, you can have multi-storey homes to all by yourself. This way, you can have your bedrooms separate from your home-office space or your living room away from your children’s study room. 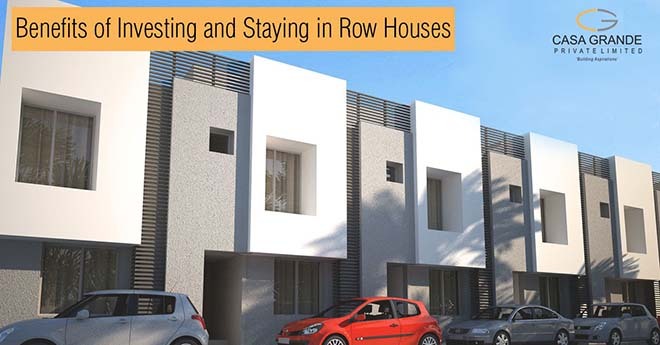 In simple terms, by opting to invest in a Row houses, you get to experience the luxury of living in a villa with all the benefits that apartments might offer.